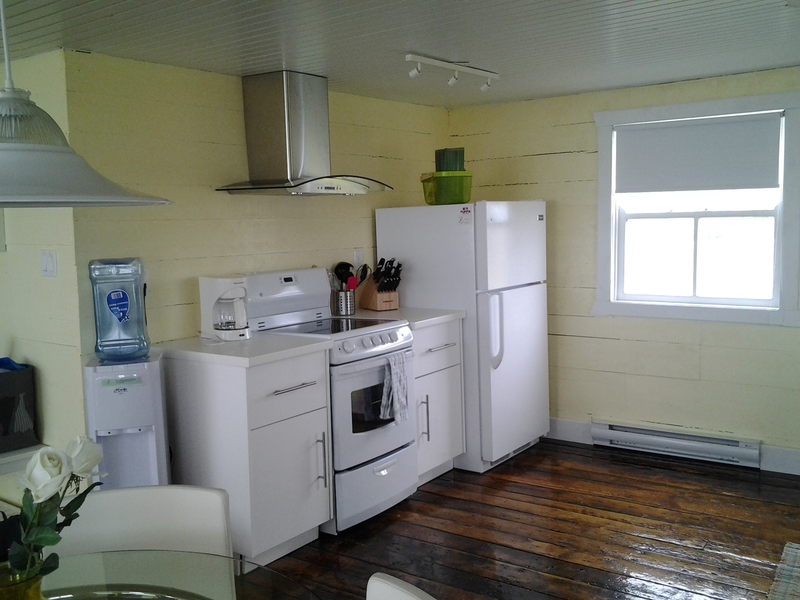 The Old Salt Box Co. has been restoring and renting century homes in both Fogo and Twillingate areas for a number of years. 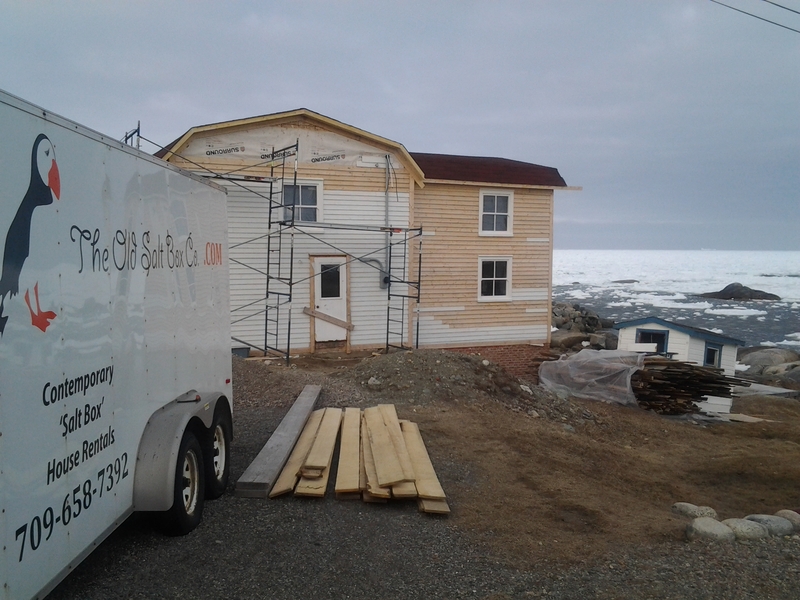 When we saw their latest projects under construction, complete with scaffolding and boarded up windows, I knew it was finally time to try one of their properties and that the Loop was our choice of location although they have great houses near Twillingate and on Fogo Island. 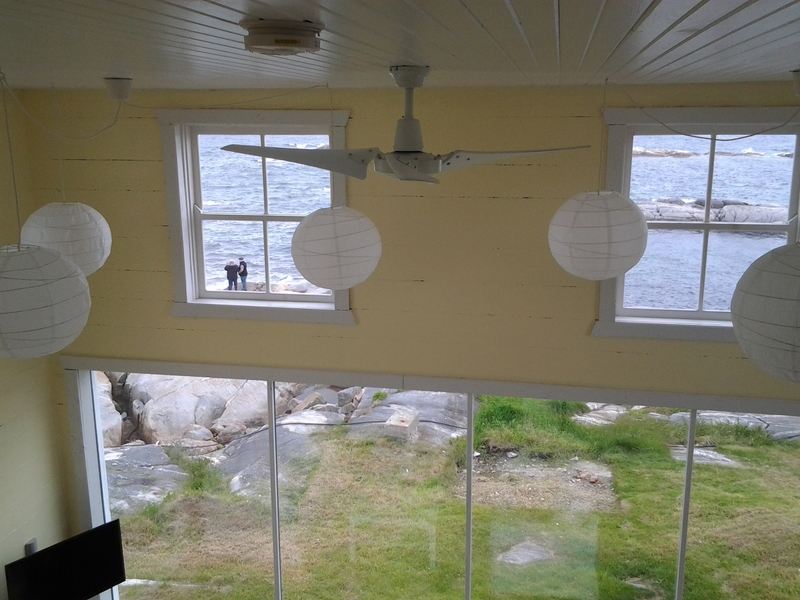 Old Salt Box House Company Greenspond renovation, May 2 2015. 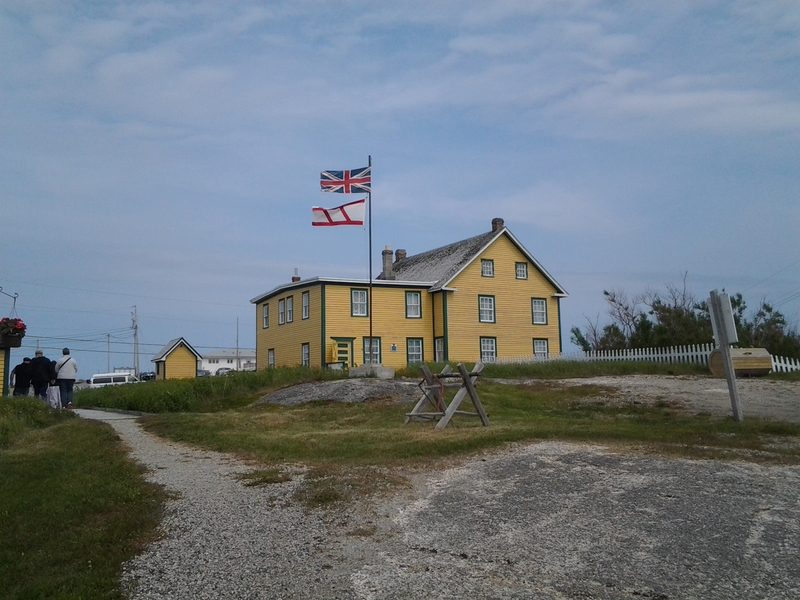 I contacted them in early May for two specific nights in July for either the Musgrave Harbour house or Greenspond house. Neither house was available for the weekend we wanted but each was available for one of the nights. Initially, we had planned to do a few day trips, one being the Loop, with my cousin Carole (remember her from our recent Fogo post?) and her husband Tim. After several rushed trips around the Loop in May, I decided it was time to do it right by going slowly and trying to visit all of the best places between Gander and Gambo via the Straight Shore. At the end of three weeks of their own touring, Carole and Tim were happy to just sit back, let someone else drive and see what happened. Leaving around noon from Gander we did a real nook and cranny tour. Leo drove us around Davidsville and through a back road to Fredricton and Noggin Cove. We went to Ladle Cove and Aspen Cove. In Carmenville we checked on the Starkes boat at the wharf and looked for icebergs just in case. It was getting late in the season but we always look for icebergs. 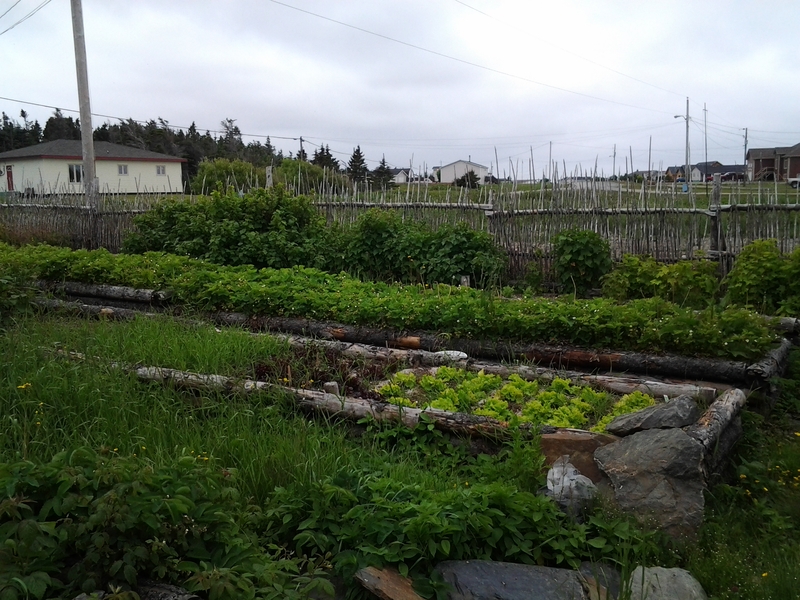 In a drive earlier in the spring, I’d noticed the great care taken for the fences and gardens around the Spindrift by the Sea in Musgrave Harbour so we made a point of stopping now that they were open for the summer. If there was that much detail outside, I was sure there was something special inside too. 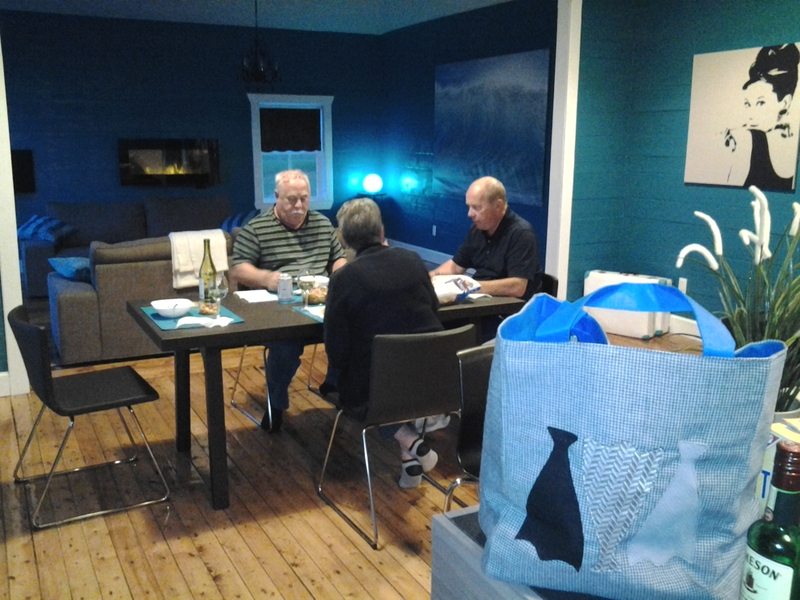 The lobby and dining room were lovely with a great view of the ocean. 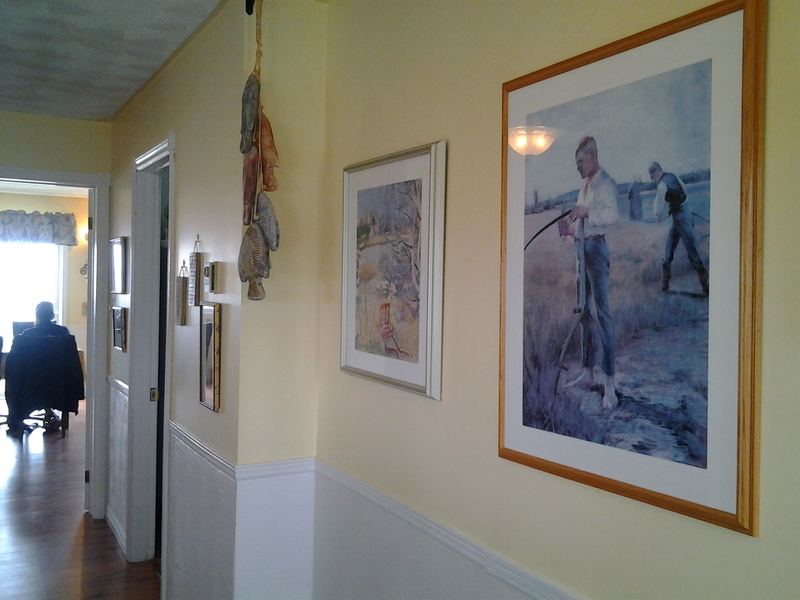 The dining room has a beautiful collection of quality Newfoundland art. This is a private collection, not a spot to pick up a print. Someone has been collecting these over a period of time. 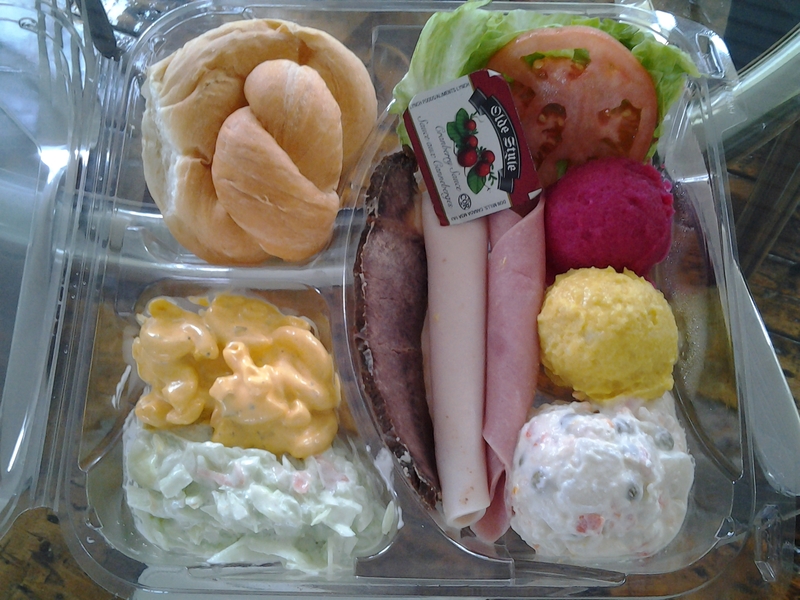 We ordered a late lunch from their full menu. 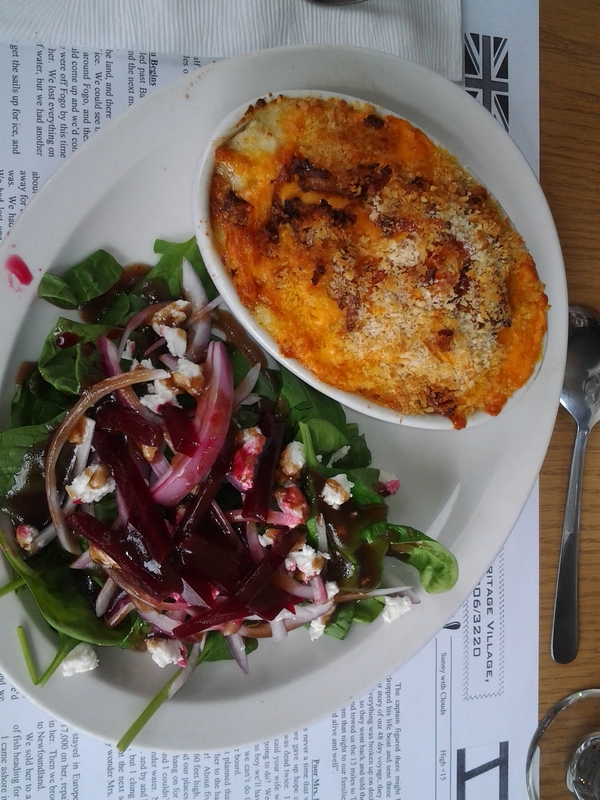 I had a hearty cod au gratin with a beautiful salad featuring greens from their own garden. Carole planned ahead and managed to add the gingerbread with rum sauce to her soup and salad lunch. Smart girl! 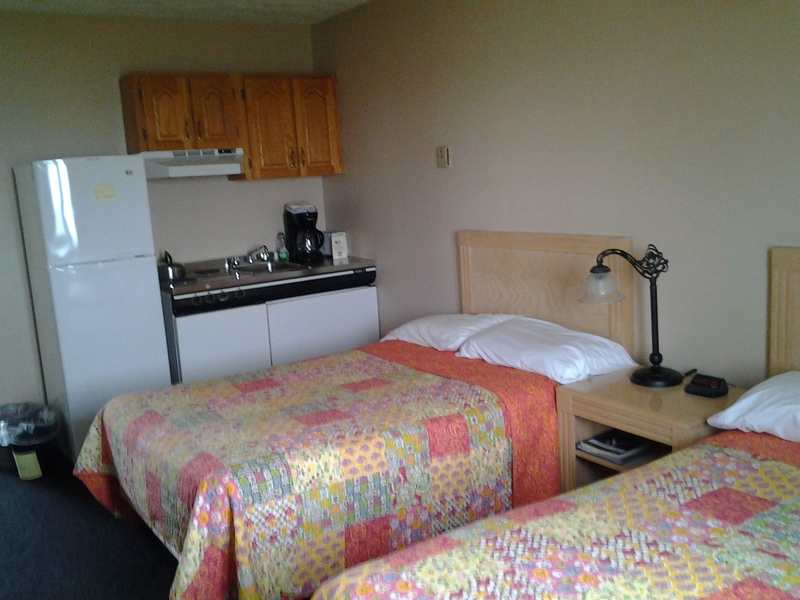 Because I like to know, I asked if I could view some rental rooms and we were given a tour of two. 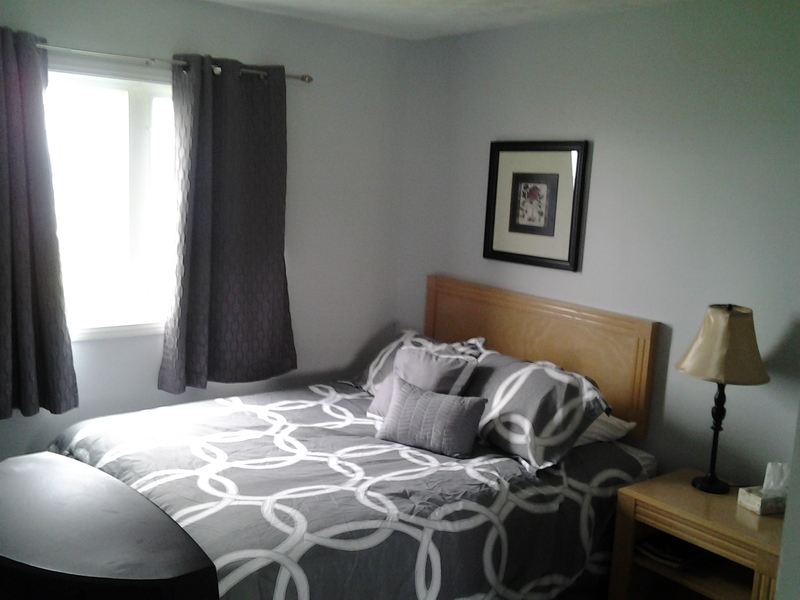 The rooms were gorgeous and spotless. 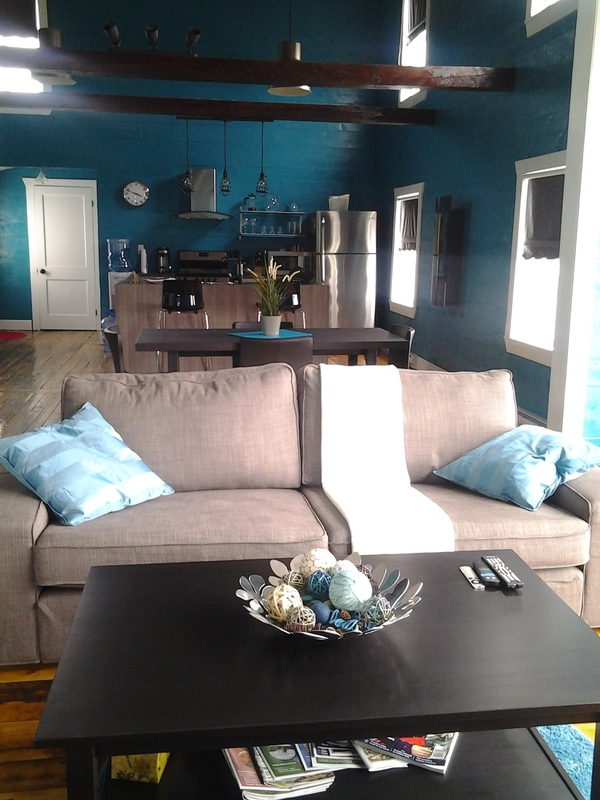 Lots of space and well appointed. No hesitation to recommend this place and I’m thinking about booking it for one of the concert nights of the Songbone Festival they are having. Concerts were offered every two weeks on a Wednesday night, all summer. So many great things to do this summer and not nearly enough time. 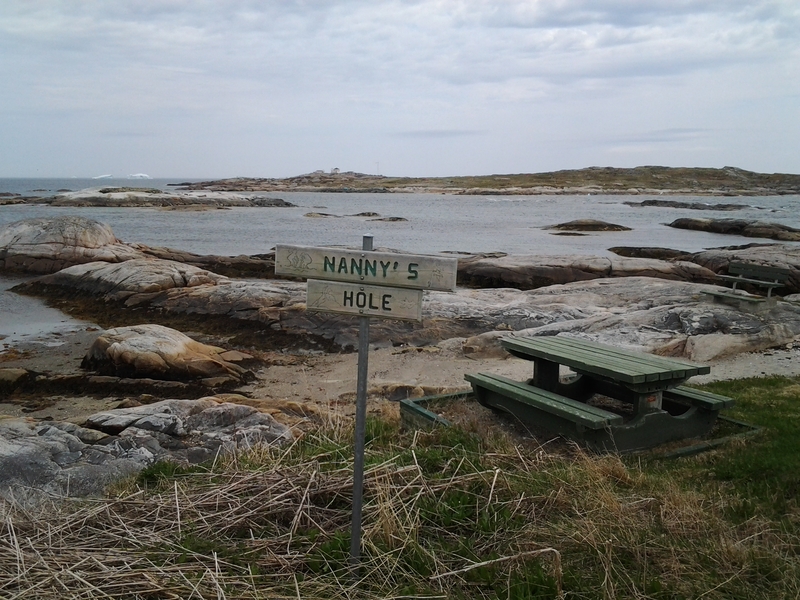 We drove through Musgrave Harbour and viewed Aunt Donna’s house from the road but continued on towards Lumsden. 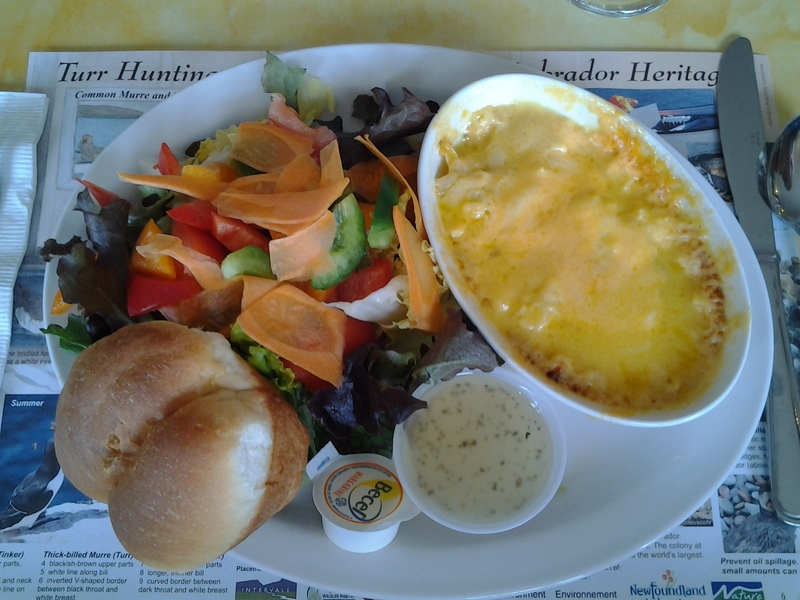 If we stopped and got comfortable in the house, that would be it for the day so we toured the straight shore and Atlantic Drive, known as Lumsden North to the locals. 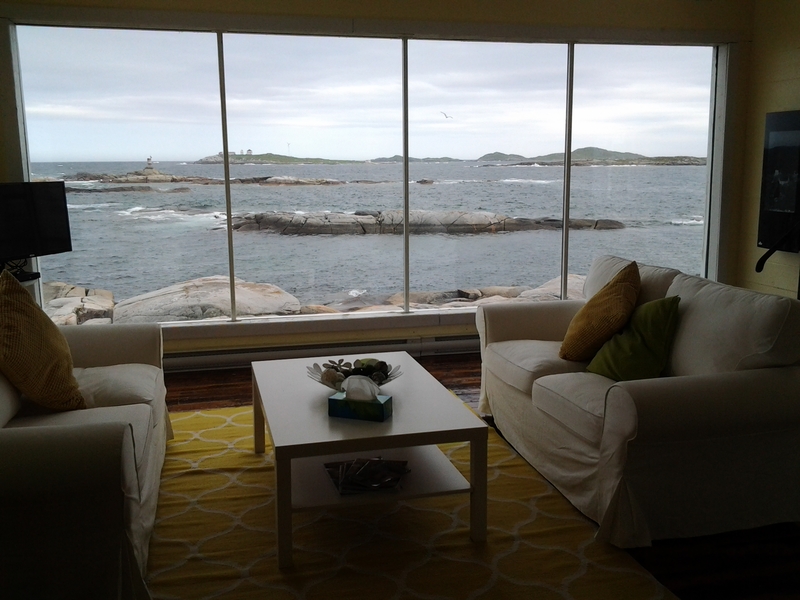 Lumsden North, last year, June 14, 2014 with icebergs. Travelling from west to east, the water view of the straight shore is beautiful but travelling back, in the opposite direction the view of the waves and the sea are much more stunning. It’s all about the angle. The Straight Shore between Lumsden and Musgrave Harbour is a great place for icebergs and sea birds. 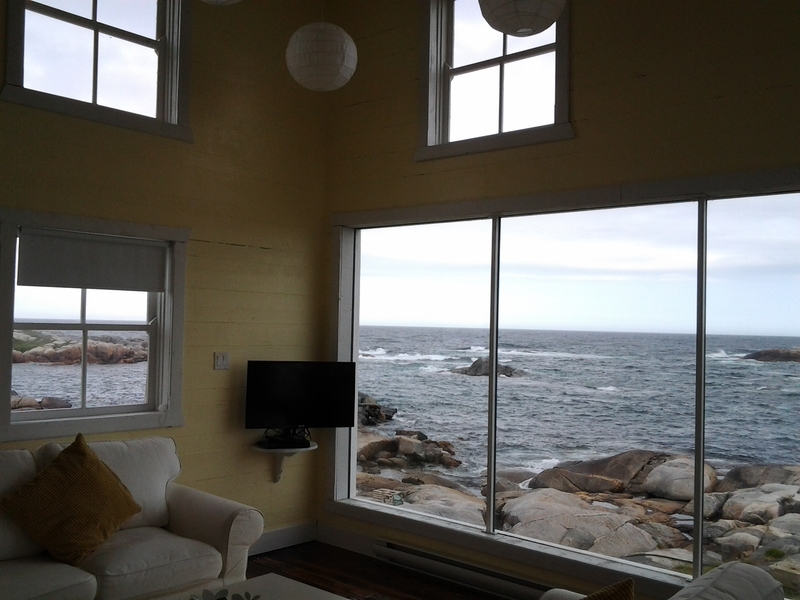 We finally settled back at the Old Salt Box House across the road from the beautiful sandy Musgrave Harbour beach. The drive-bys three times while it was under construction and even the beautiful pictures on their web page didn’t prepare us for how lovely this home is. We all took mandatory pictures before we made a mess with our luggage and groceries and then sat back and grinned at each other for an hour or so. With Leo’s binoculars we kept an eye on a fisherman bringing in his lobster pots and we may or may not have waved at the cars as they drove by on the main road. A few people may or may not have waved back. Supper was an easy heat up of chili, bean salsa and nachos served with fresh rolls and apple turnovers from The Gander Bread Box. Leo and Tim had appetizers of Bread Box snowball cookies. A good thing I bought two packs. More grinning and giggling ensued. Man that was a pretty house. I remember discussing this company with a friend and saying to her that their trademark was the huge window. 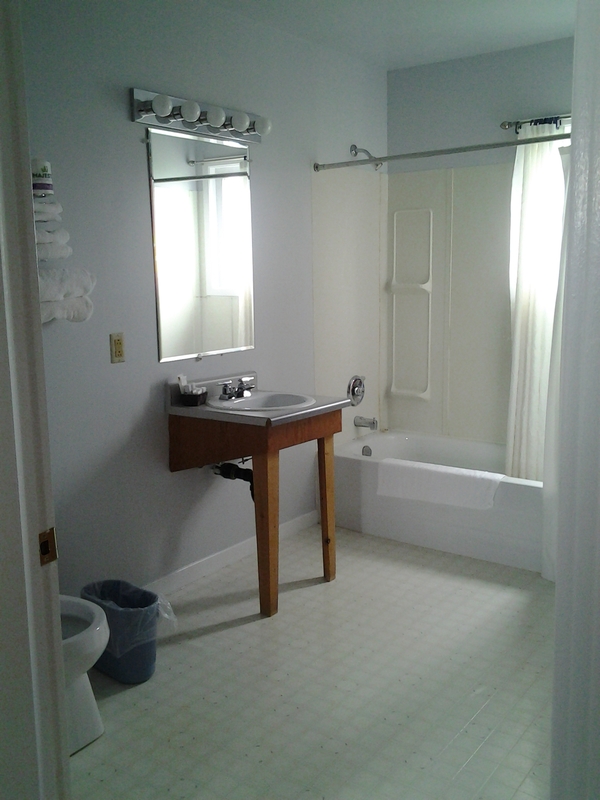 She corrected me and said the window and the footed tubs. 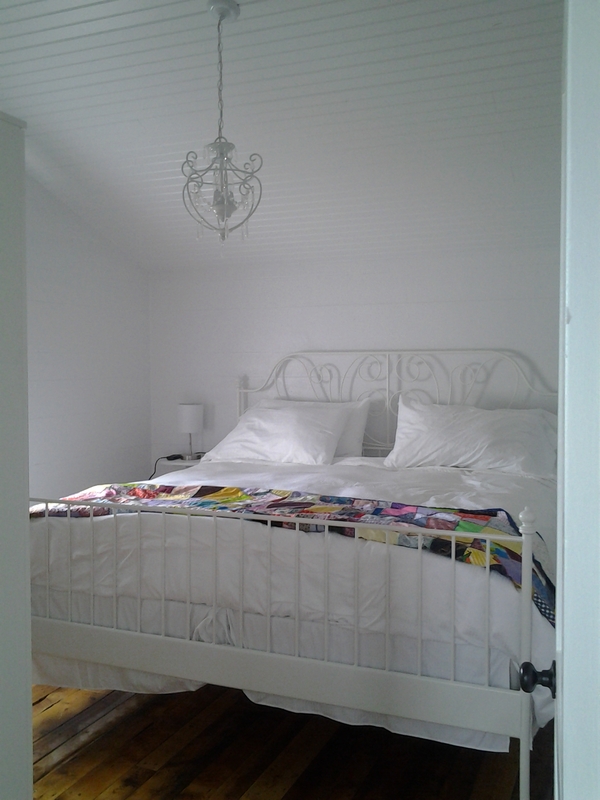 No need to sit up late when we were all eager to crawl into the beautiful bedrooms. Early to bed and early to rise to drink coffee and watch the church traffic and seagulls. 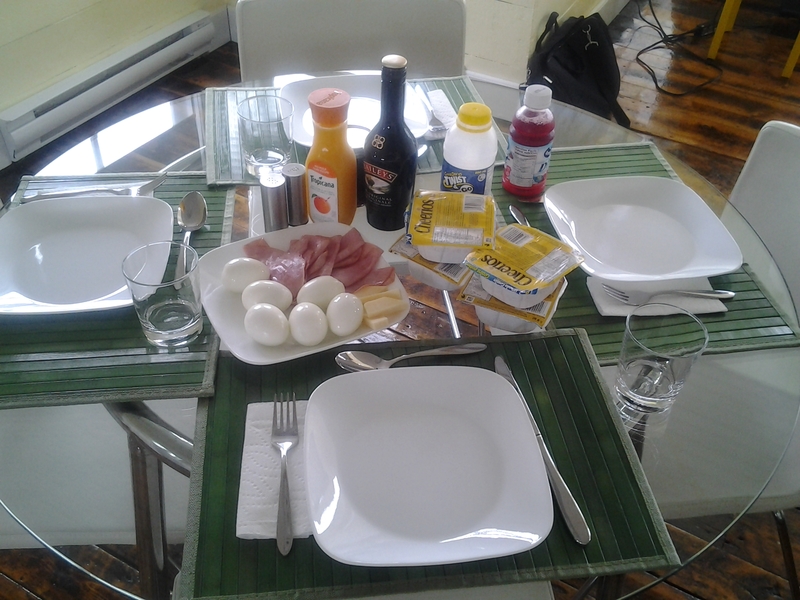 Improving on our last week, I had boiled eggs ahead of time making breakfasts easier to prepare and carry. This was a two pots of coffee kind of place. 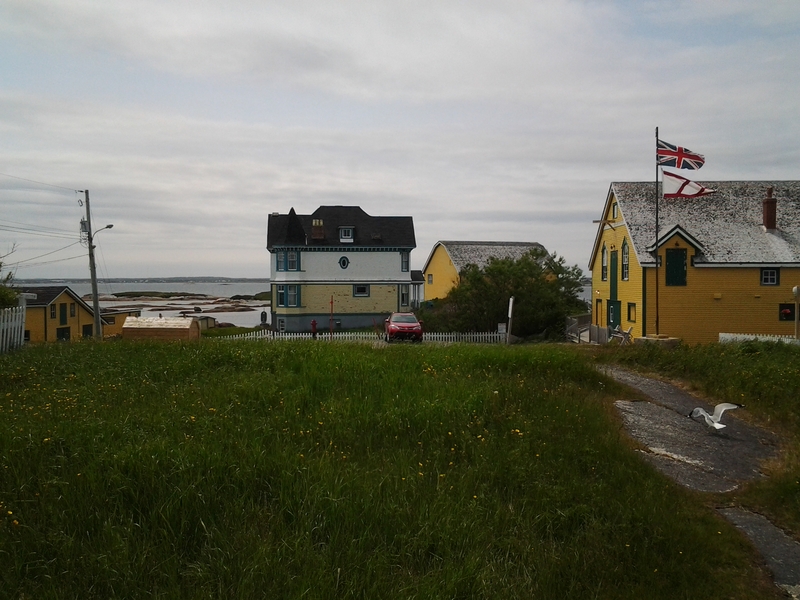 If we didn’t have Greenspond to look forward to, it would have been a tearful departure. We’d seen a couple of icebergs at a distance on the Straight Shore near Anchor Point on Saturday. By Sunday, they were close enough to know they were huge but still very far out. 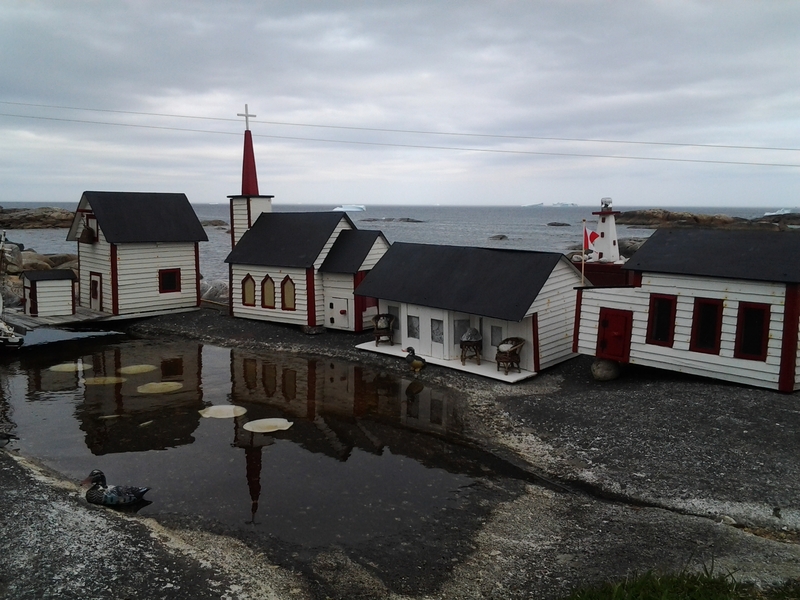 Maybe they too were heading for Greenspond? We visited wharves in Musgrave Harbour, Lumsden and Cape Freels admiring the large and small boats and the enormous breakwaters protecting them. These communities are all beautiful and careful touring around the wharf is very interesting. At lunch time we toured Newtown and had seen 5 icebergs by that point. All too far out for photographs but we saw them. 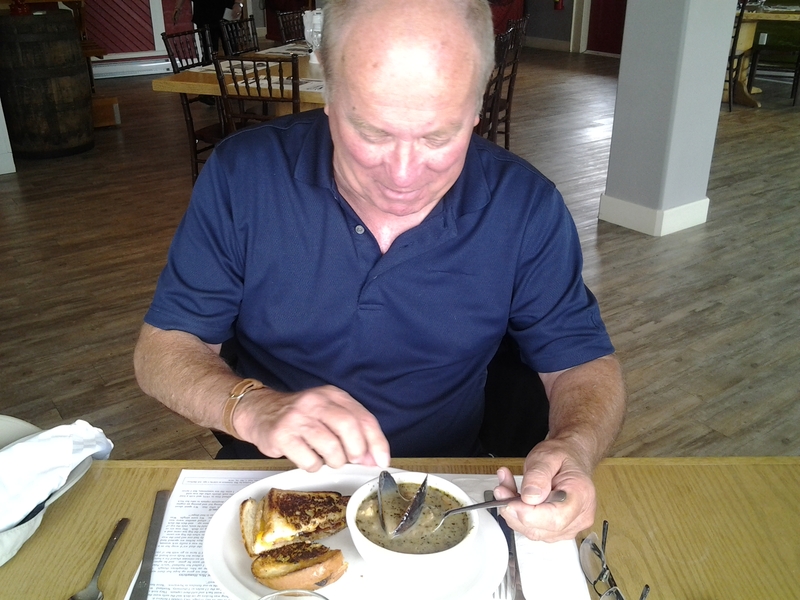 Lunch at the Olde Shoppe Restaurant was on my list of things to do that trip. 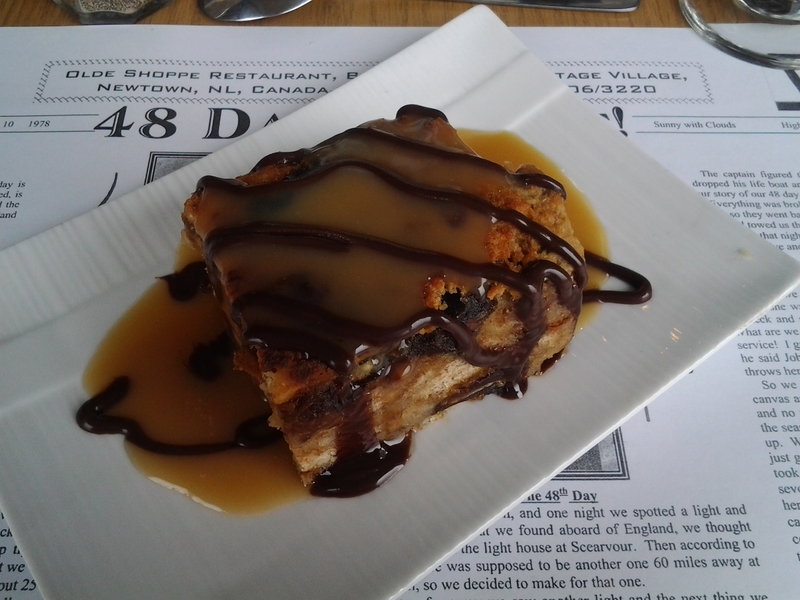 I followed Carole’s lead on ordering dessert this time and was not at all disappointed by the bread pudding with dates. A nice variation on a traditional dessert. 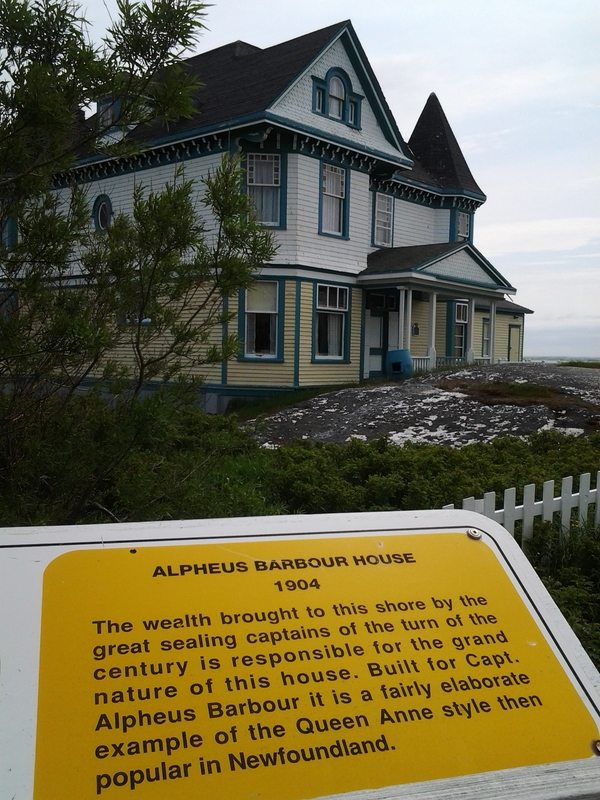 Barbour Living Heritage Village requires a tour guide. 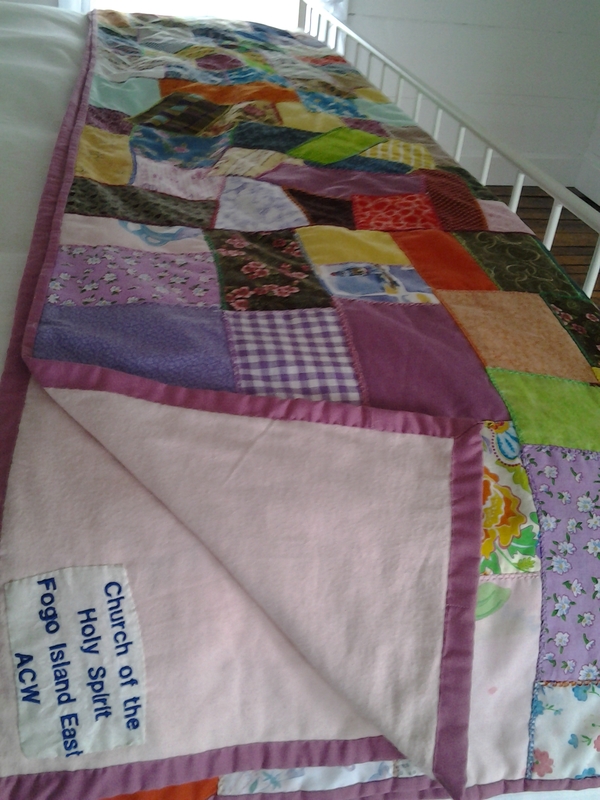 Ours was also a playwright and actress in some of the summer theatre productions. Pretty accomplished for someone I suspect may still be in high school or at the most and early college student. The Village is a series of buildings including a school, Barbour family homes and other additions such as a theatre. My favourite building here is still the boat house where a new building was designed to feature a scaled model of a schooner as part of the first and second floors of the building. The design works well for a number of reasons. It’s accessible in all weather and lower maintenance than an actual vessel and I would guess, less of an insurance burden than if they were touring people on a boat. 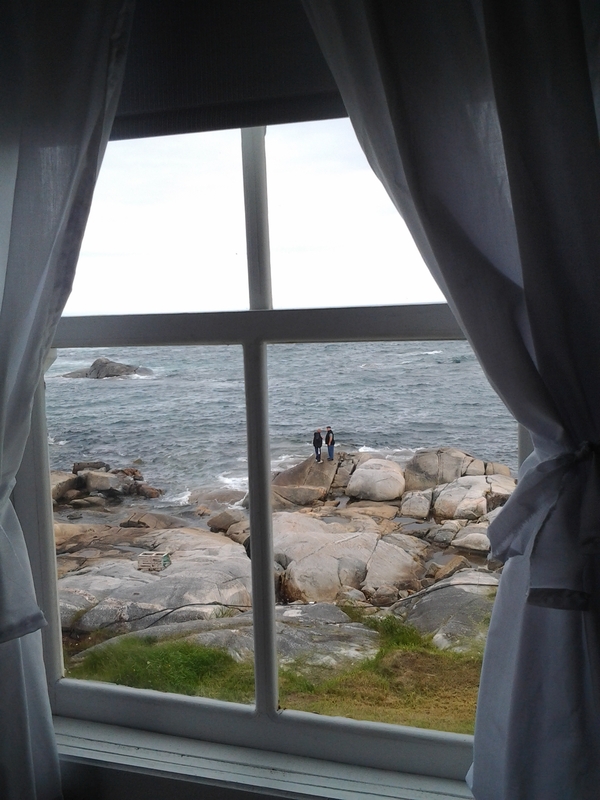 From Newtown we ambled on to Greenspond, still looking for icebergs but only seeing them at great distance and in small numbers. We should have bought that helicopter! We did a mental inventory of munchies and food we were carrying and figured with a few snacks from the local shop, we’d probably be good to make up a supper of some sort once we needed it so after doing a tour around the town, settled at the amazing Aunt Cristi’s house. 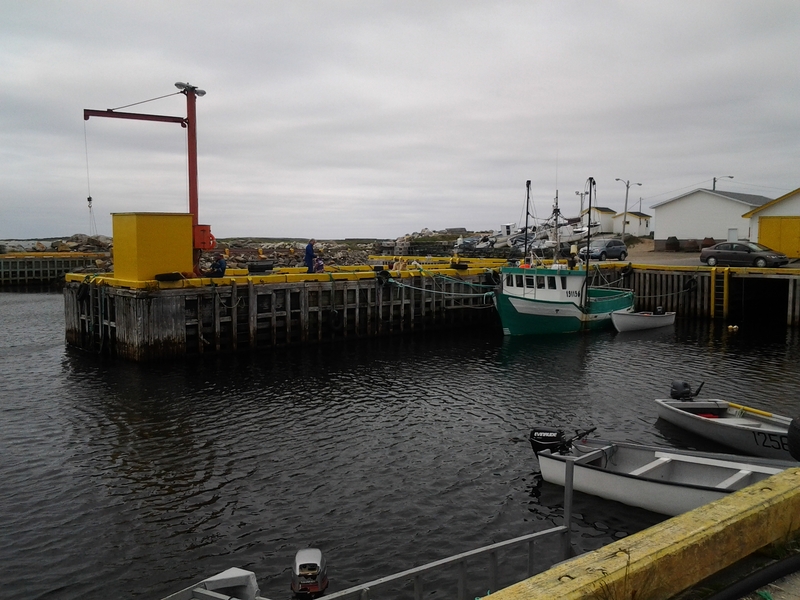 Scenes from Greenspond, May 2015 and month before this trip. 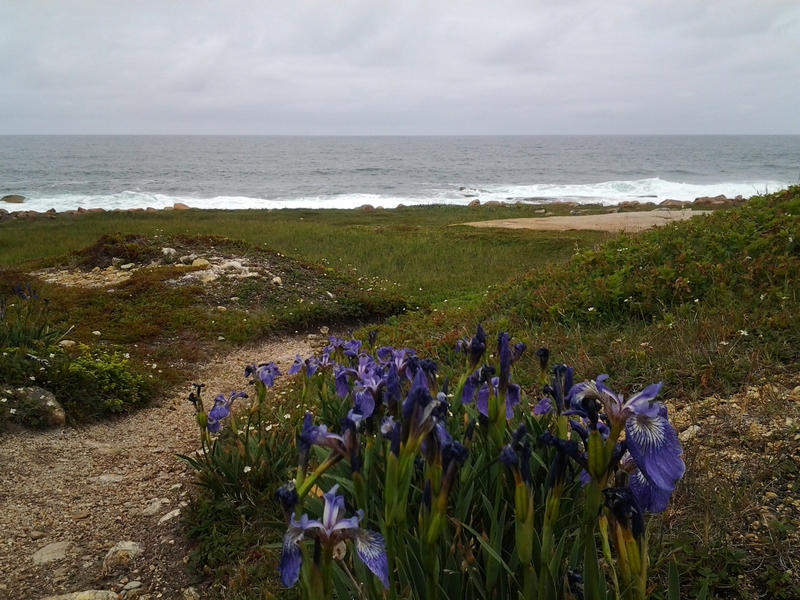 Icebergs in front of Aunt Cristi’s house in May 2015. 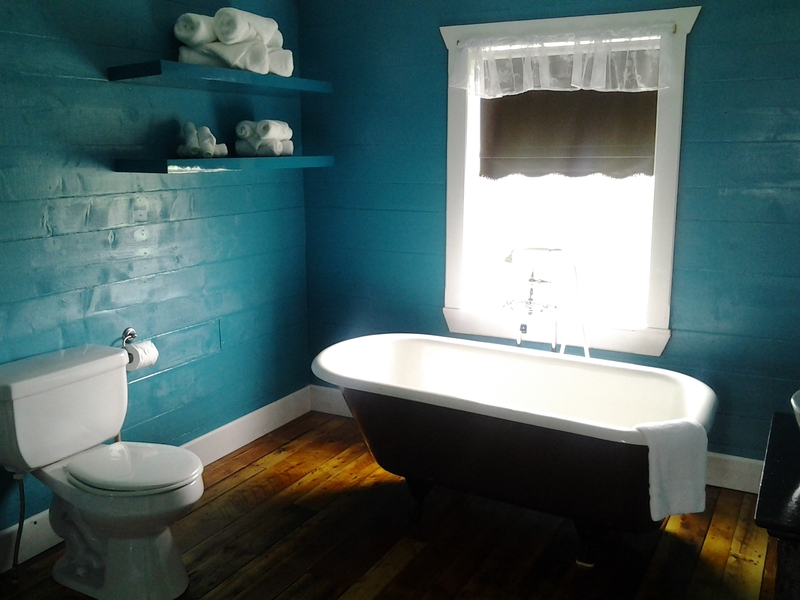 As the latest house to be finished, this property shows the maturity of the Old Salt Box House Company’s design savvy. This house was a dream. Wide, silly grins ensued for the rest of the night and again in the morning with the view and comfort. Again, giggles and sighs were enough to make us think we deserved more food so we checked out the local shop Dyke’s Marine Services, etc. Thinking of adding some chips or something to our collection of snowball cookies and nachos and salsa we were delighted to find out that the shop offered cold plates. 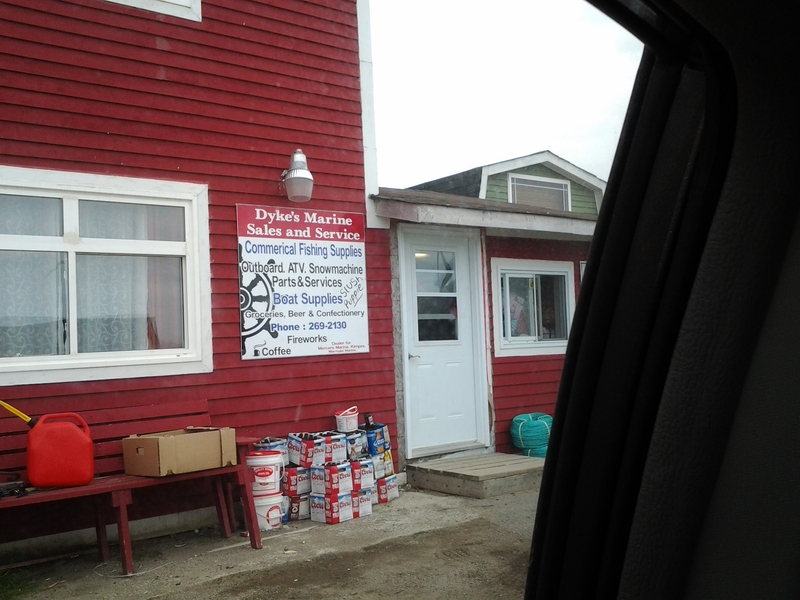 Marine services, cold plates, groceries and beer, what more could you need in Greenspond, NL? 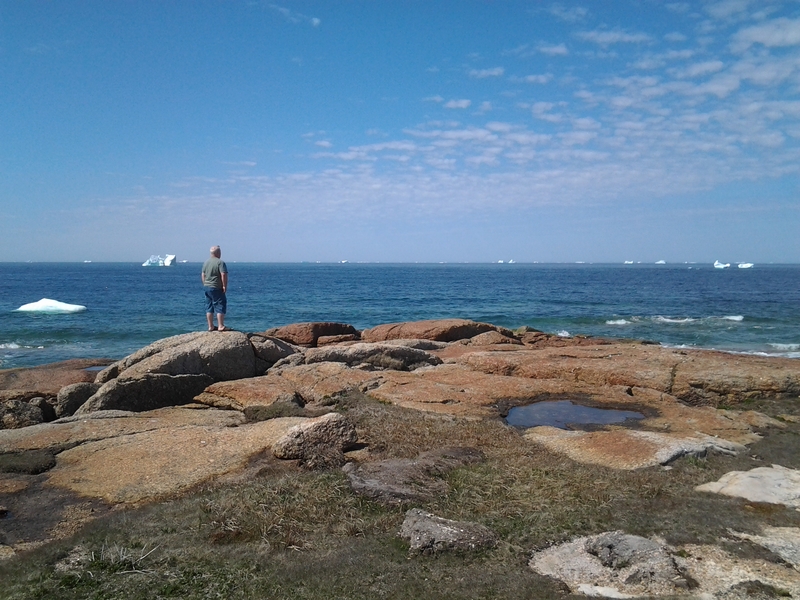 On our previous visits to Greenspond this year we’d seen icebergs in huge sizes and numbers. Although we had a rainy night and morning, it sure didn’t impact on our enjoyment of the house and the company and yes, we ate yet again before hitting the road. 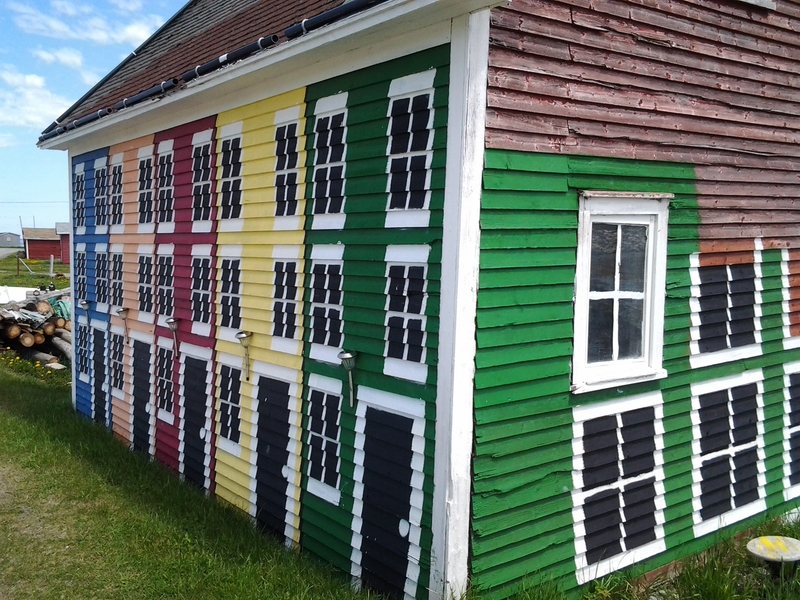 Aunt Cristi’s House, The Old Salt Box Co., Greenspond, NL. 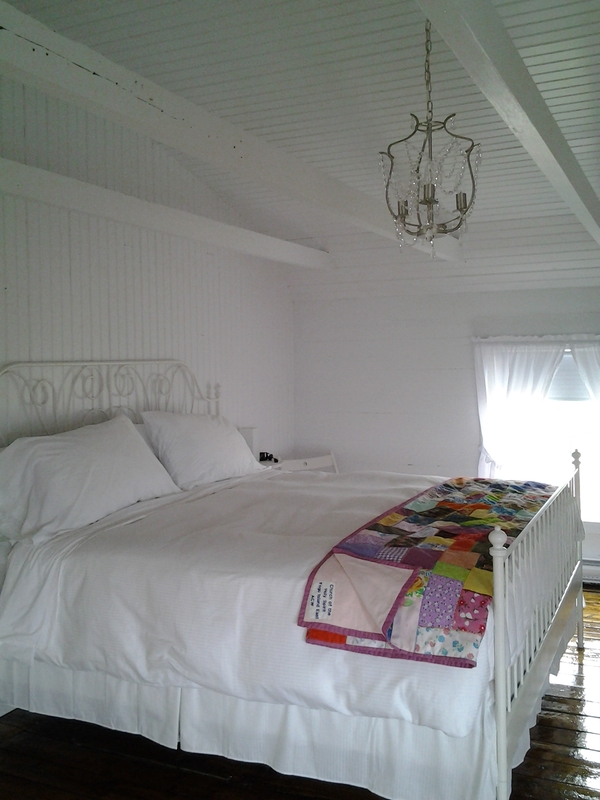 As we were getting ready to go, the housekeeper arrived, apologizing for being there a few minutes early. It was lovely to meet her and hear that this was the house her mother grew up in and she was obviously very proud to be keeping it in such beautiful condition. With 8 houses in 6 communities, meaningful jobs, not just accommodations have been created while preserving the homes that otherwise would probably not be used. 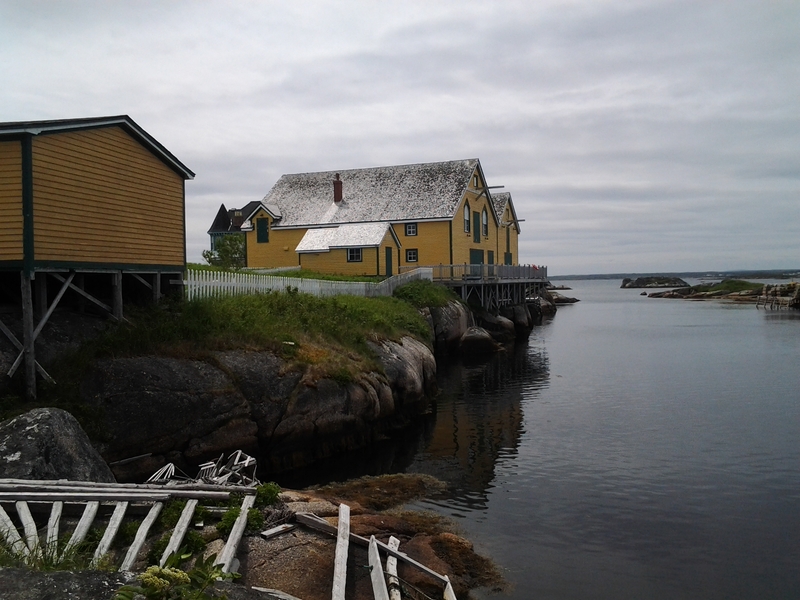 Aunt Cristi’s House, Old Salt Box Co., Greenspond, NL. As an opening weekend for our holidays and the finale for Tim and Carole, this was a great weekend to see the scenery and sights of the Loop. Two nights was almost perfect and we could have enjoyed the Lumsden or Musgrave Harbour beaches if we had more time and the right weather so even an extra day might be good too. I wonder if they’d do me another Salt Box House? 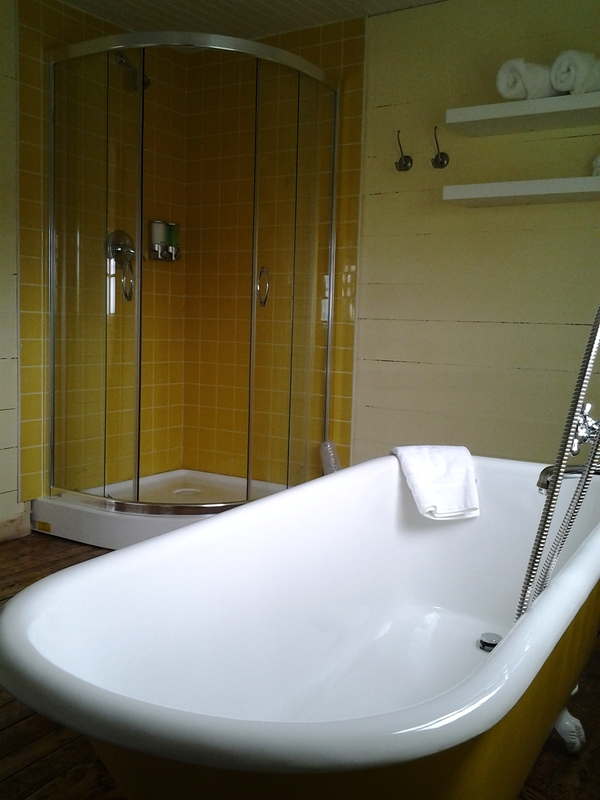 P. S. The Old Salt Box Co. are very heavily booked so if you are thinking about it, book early. 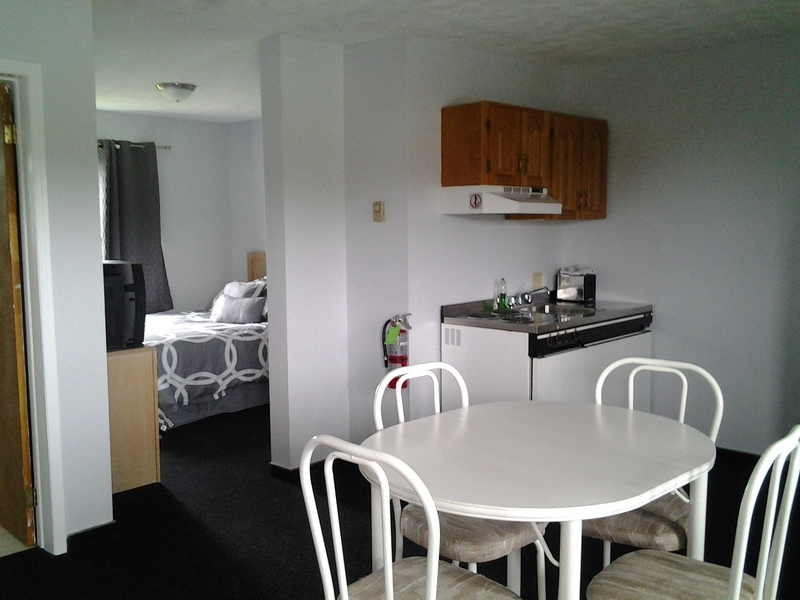 There were only about 6 vacant nights this summer. 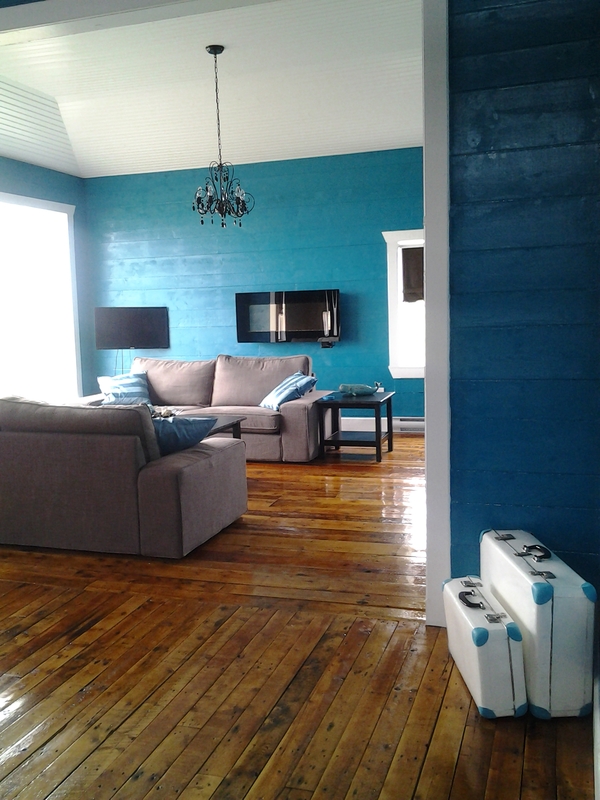 With 8 properties in rural Newfoundland, they have this figured out and are getting lots of return guests. We’ll be two. Check them out on Facebook or their website. 2018 Update is they now also have houses in Burgeo and Francois! 10 beautiful homes to chose from. 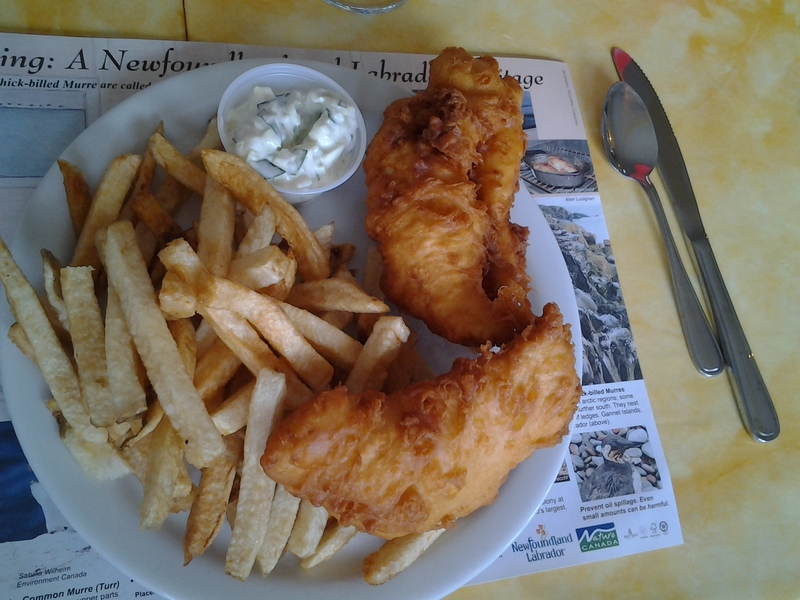 8 or 9 years ago, I had a meal of halibut at the Spindrift Motel and I’m still talking about it. I should really go back!